A member of the Horizon Poker Network, Juicy Stakes explained that the Thursday and Friday versions of its $60 buy-in Sundowner no-limit hold‘em tournaments come complete with $1,200 prize pool guarantees while this is increased by a further $300 for the Monday, Wednesday and Saturday games. However, online poker aficionados will now be able to compete for a share of $2,500 in cash via the new $16.50 buy-in Sunday Sundowner tournaments. Set to kick off from 5:15pm New York time, the new no-limit hold‘em additions will feature 15-minute blinds and see players begin with a $10,000 starting stack. 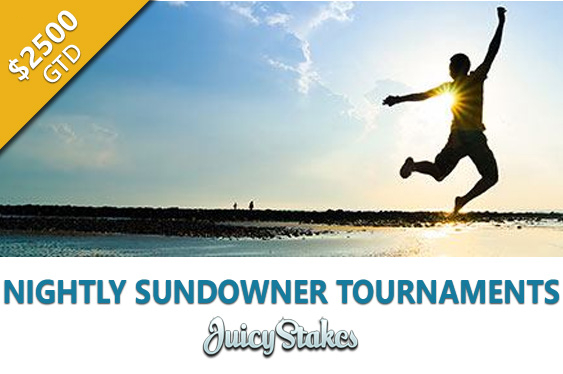 For those looking to take part in a Sunday Sundowner for less, Juicy Stakes declared that it is moreover running $2.20 buy-in turbo R&A satellite competitions every Saturday from 9:29pm. These qualifiers are to feature five-minute blinds alongside $1,500 starting stacks with each awarding at least one seat into the next day’s tournament. Online poker aficionados can now compete for a share of $2,500 in cash every Sunday from 4:30pm.